After 263 years, the shogunate was overthrown under the banner of restoring imperial rule. In 1869, the figurehead 17-year-old Emperor Meiji moved to Edo, which was renamed "Tokyo" ("Eastern Capital") the year before. 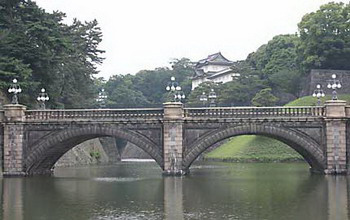 Tokyo was already the nation's political, economic, and cultural center, and the emperor's residence made it a de facto imperial capital as well with the former Edo Castle becoming the Imperial Palace. The city of Tokyo was established, and continued to be the capital until it was abolished as a municipality in 1943 and merged with the "Metropolitan Prefecture" of Tokyo. Tokyo went on to suffer two major catastrophes and has recovered remarkably from both. One was the Great Kanto Earthquake in 1923, and the other was World War II. The firebombings in 1945 were almost as devastating as the atomic bombs of Hiroshima and Nagasaki combined. Large areas of the city were flattened. After the war, Tokyo was completely rebuilt, and showcased to the world during the city's 1964 Summer Olympics. Tokyo became the largest city in the world in 1965 (taking the lead from New York). The 1970s brought new high-rise developments such as Sunshine 60, a new and controversial airport at Narita (well outside Tokyo), and a population increase to about 11 million (in the metropolitan area). Tokyo's subway and commuter rail network became the busiest in the world as more and more people moved to the area. In the 1980s, real estate prices skyrocketed during an economic bubble. The bubble burst in the early 1990s and many companies, banks, and individuals were caught with real estate shrinking in value. A major recession followed, making the 1990s Japan's "lost decade" from which it is now slowly recovering. Tokyo still sees new urban developments on large lots of less profitable land. Recent projects include Ebisu Garden Place, Tennozu Isle, Shiodome, Roppongi Hills, Shinagawa (now also a Shinkansen station), and Tokyo Station (Marunouchi side). Buildings of significance are demolished for more up-to-date shopping facilities such as Omotesando Hills. Land reclamation projects in Tokyo have also been going on for centuries. The most prominent is the Odaiba area, now a major shopping and entertainment center. An older method of romanizing Japanese resulted in "Tokio" as an earlier spelling. During the early Meiji period, the city was also known as "Tōkei". Surviving official English documents used the spelling "Tokei"